Flaking: Although this occurs in all dogs to some degree, it should not be noticeable in a dog that has normal skin. Flaking occurs when dead skin falls off of your dog; it is usually noted on the belly or underarms. Dandruff: Similar to flaking, dandruff will come off in pieces. You may notice white flakes of dead skin anywhere that the dog has chosen to lie down. Scaling: With this condition, the skin comes off in large sections, not just flakes. Shedding: With most cases of dry skin, the hair loss is all over the dog's body, as seen in shedding. In some cases, the dog will have spotty or patchy areas of missing hair. Pimples: Pimples appear as small, red bumps. If they are on the chin, especially if you have a short-haired breed like a Rottweiler or Pug, your dog might actually have canine acne, which is unrelated to dry skin. Scabs: When pimples swell, they may eventually break open when your dog itches. They might scab up before you even notice them. Redness: Red skin is a sign of inflammation. If your dog has dry skin, it is more likely to become infected and inflamed. Odor: Dry skin can begin to stink in the presence of a bacterial or yeast infection. If you ignore dry skin when it is just flaking and scaling, it can lead to a more serious problem that causes odor. Itching: A lot of times, an owner will not notice dry skin until the dog becomes itchy. Since the dog does not have allergies and will not respond to steroids, it will continue to scratch and need to be treated as described below. The most effective remedy for your dog's dry skin is to switch his diet to real food. Don't be deceived—the largest retailers of dog food sell the most dog food compared to other brands because their product cheap. Unfortunately, cheap dog food diets are lacking in many nutrients that would otherwise keep your dog's skin from drying out. Even if you do not buy the cheapest brand of dog food, other dog food brands that are able to sit on the shelf for months are not what your dog needs either. 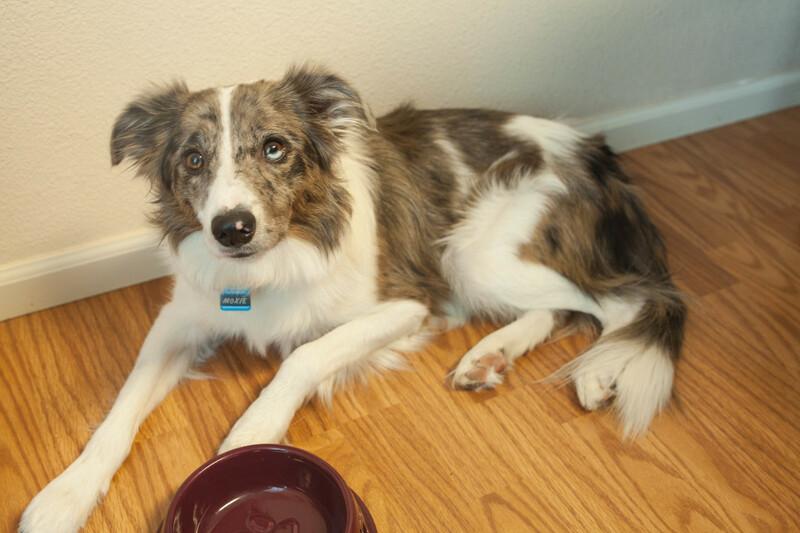 What Kind of Food Does Your Dog Need? Your dog needs a raw diet that provides essential nutrients and oils to improve his health and the quality of his skin. The majority of his diet should be raw, meaty bones. This type of diet will provide your dog with every essential nutrient to keep his skin health: essential fatty acids, vitamins, minerals, enzymes, and antioxidants. 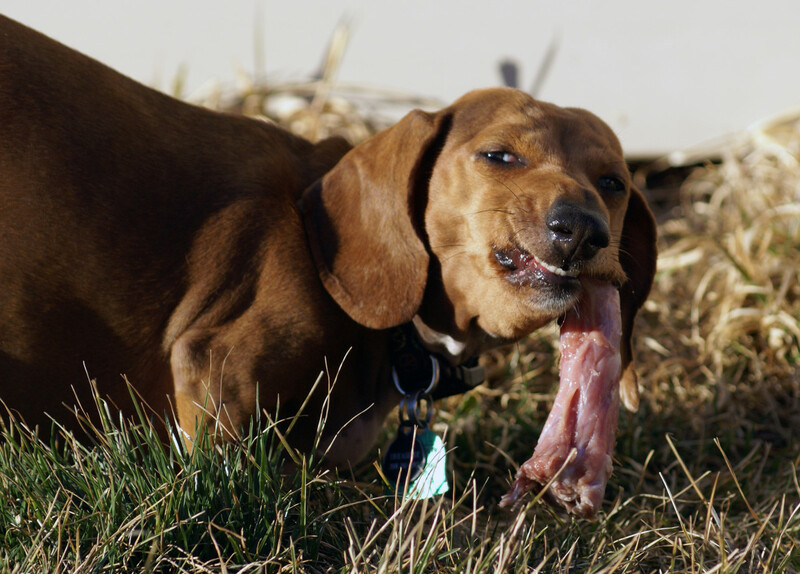 It may not matter which meaty bones you use as long as your dog has no allergies and you vary what your dog is eating. Grass-fed beef is excellent, and your butcher will also be able to provide you with many of the cheap cuts of other animals that humans do not care for (tails, etc.). Chicken carcasses are another good source, and chicken wings can sometimes be found on sale. Chicken necks have a lot of fat, so if you use them, remove the skin and feed them with something else. Chicken feet are low in fat, are a great source of calcium, and also have good levels of glucosamine which keep your dog’s joints healthy. Source: Grass-fed beef, cheap cuts (tails), chicken carcasses (wings, necks, and feet). If the meat you are giving is less than half bone, you do not need to worry about this. If not, add a little meat to the diet. Source: Beef tongue, beef heart, beef cheeks, and other sources that are inexpensive. You need to vary which meats you give your dog, but if you establish a relationship with your butcher, he will be glad to sell you those parts that he cannot market to his human customers. Source: Kidneys, lungs, liver, spleen, etc.. This is not absolutely necessary and also depends on what your dog likes. Dogs will usually eat most veggies if they are mixed with their main diet, but they need to be put through a blender so that they are as fine as the contents of a cow's stomach. If they are not blended finely, they will pass through the dog without being digested. 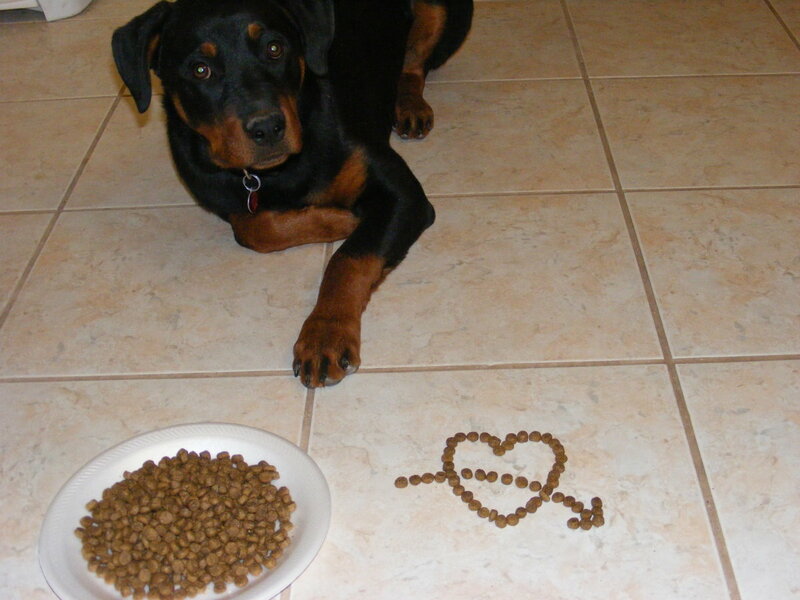 Some people also bulk up their dog's diet using cheap sources like potatoes, rice, and grains. Your dog does not need these starch sources. Source: Broccoli, spinach, other dark, leafy vegetables, and carrots. I add eggs to my dog's diet when I am mixing in the veggies. If I am thawing meat at the same time, I add the blood to the mix to improve palatability. The fruit you have available will vary depending on your location, and if you have nothing available, it is not an absolute necessity. I like to add fruit to my dog's veggie and egg mix. The dogs are more interested in eating the mix if it contains fruit. Source: Papaya, avocado, and banana. If you have access to fresh fish, you can give him a meal with this about once a week. Fish with the highest levels of omega-3 fatty acids (oily fish like mackerel and sardines) are your best choice. 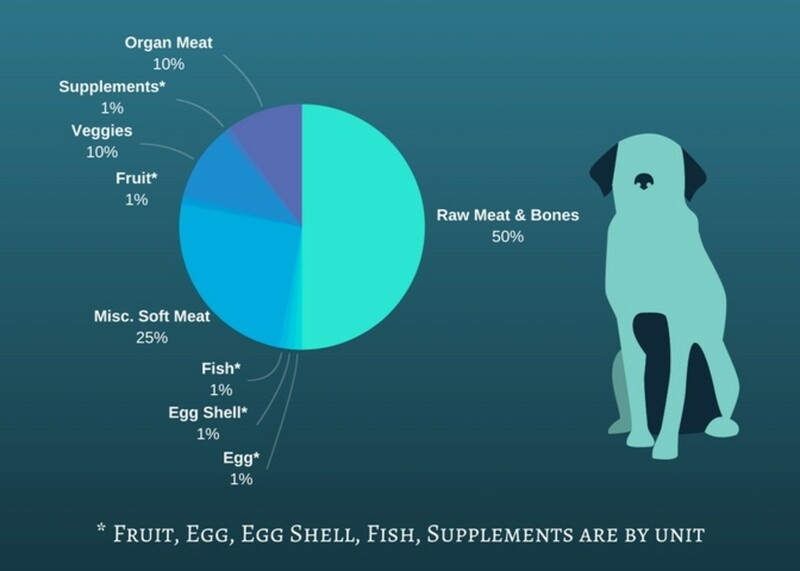 If your dog is eating a raw diet, supplements like probiotics are not necessary. It is still a good idea to provide some extra omega-3 fatty acids through a fish oil supplement if fish cannot be provided, and if your dog has health problems (hip dysplasia, luxating patella, etc. ), then you will want to add extras like vitamin C.
You do not need to be a nutritionist to feed your kids, and you do not need to be a licensed veterinary nutritionist to take care of your dog. If you feel like you cannot provide a healthy, raw diet for your dog, the best alternative is a homemade cooked diet. A vegetarian cooked diet is also a healthy option, but not a substitute for the raw diet I have outlined above. Dr. Pitcairn has several vegetarian diets in his book, but there are also vegan diets available from other sources. The chickpea diet is a good one, but you will need to supplement the omega-3 fatty acids. If you do not want to use fish oil, then you can use flax oil. 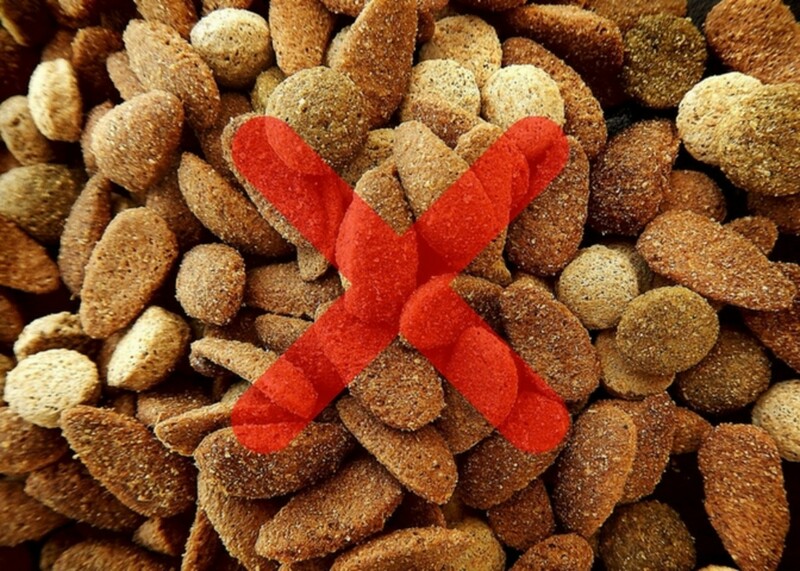 If you choose to continue feeding a cheap commercial dog food, your dog will probably continue to have dry skin. The AAFCO-approved diets labeled “sensitive skin” and “healthy skin” are probably better than the other supermarket diets, but then again, they might not help. AAFCO is a voluntary organization and cannot fully identify 100% of ingredients. According to the AVMA, about 40% of foods tested contain proteins from animals that are not even listed on the label. Brush your dog daily: If you have noticed your dog's dry skin, you might already be brushing him every day. If you have not, brushing helps to remove dead skin and also helps to distribute the inflammatory cells that congregate in the area where the skin is most itchy. Brushing alone will not take care of your dog's dry skin, but it will help it clear up quickly when you are providing other therapies. 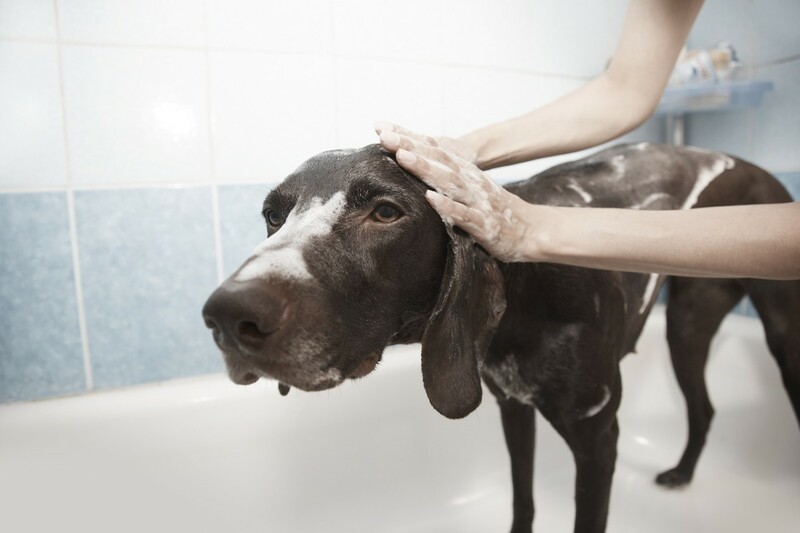 Bathe your dog: Give your dog a bath with a shampoo that will help moisturize the skin and relieve itching. The best shampoo for dry skin is colloidal oatmeal. Oatmeal-based shampoos contain polyphenols and the antioxidants avenanthramides, which have an anti-inflammatory effect and relieve some itching. All shampoos, including oatmeal, strip the skin of some of its protective oils, so if you are just bathing your dog to get rid of some dirt he rolled in, you can just use plain water. Soothe your dog's skin with a dry shampoo: If you want to give him a little itch relief but have bathed him recently and do not need to do so again, you can use dry oatmeal shampoo. Take some regular oatmeal and blend it until it is a fine powder; take a little and massage it into the itchy areas. Most sources recommend warming the paste a few minutes before using it so that more of the oatmeal's oils will be released. You should leave it on there about 20 minutes before combing it out. You can do this every day if your dog needs it. Apply apple cider vinegar: No studies have proven that apple cider vinegar (ACV) will help dry skin, but for those of us who have used it, we have seen its benefits as a humectant. Given orally, it acts as a natural acidifier and may increase blood flow to the skin. Given topically, organic ACV will improve the flora on your dog's skin since it contains lactobacillus which will replace the bacteria that can cause some of the secondary skin problems. I also use it topically to decrease the yeast populations on my dog's skin and replace them with a healthier bacterial population. Bathe them in Epsom salt: I recommend using Epsom salt when a dog has swollen feet, but I do not use it for dry skin. 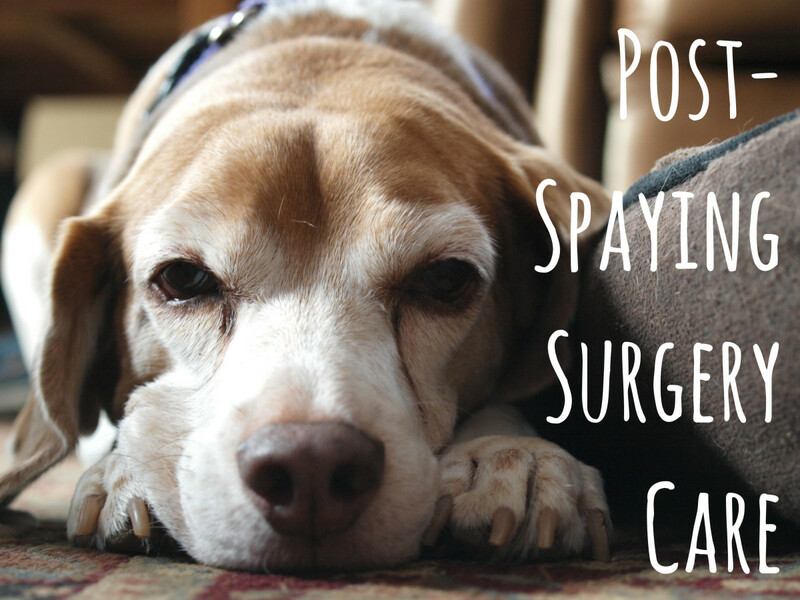 It can help with open sores though, so if your dog has been itching and has scratched himself deeply, this can help. You can add about a half cup of salts to his bath water, but be sure to rinse it off after you are done. Cover affected areas with baking powder: Make up a baking powder paste to apply to the inflamed and itchy parts of your dog's skin. It needs to be about half water and half baking soda; apply it right on the area. Leave it on for about 15 minutes and clean it off with cool water. Add eucalyptus essential oil to the shampoo: Although there have been a lot of dangerous cases of misuse involving essential oils, I have found them to be helpful if used properly. The safest and most effective is eucalyptus oil, but some vets have also had success with pennyroyal or evening primrose oil. Essential oils are not a cure, but a few drops of the oil can be added to the shampoo, and the anti-inflammatory properties help diminish itching. If you have made up a shampoo for the first time, be sure to try it on one small spot to check for allergies. Soak your dog in herbs after his bath: If your dog seems itchy even after a bath of colloidal oatmeal, you can try using an herbal soak. Take your dog out of the bath after rinsing, fill the tub back up with warm water, and add a few liters of green or chamomile tea (prepare it ahead of time). 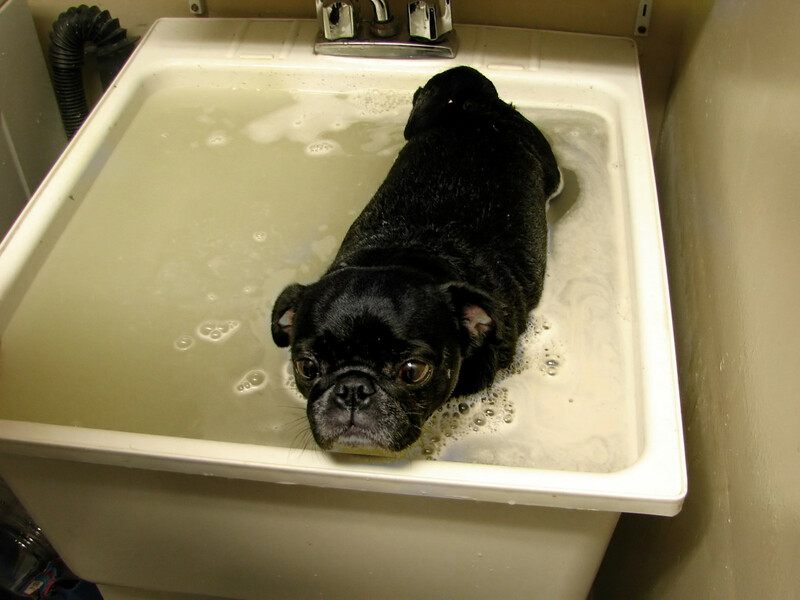 As long as it is not too hot or cold, you can pour it on your dog's skin as he sits in the tub, but let him soak in the dilute mixture for about 15 minutes. Yogurt: Yogurt is a moisturizer that also contains “good” bacteria which can help to recolonize the skin. If you give your dog a small amount (anywhere from one teaspoon for a small dog, to one tablespoon for a larger dog) each day, those bacteria can also improve your dog's GI system and keep him from developing diarrhea as easily. 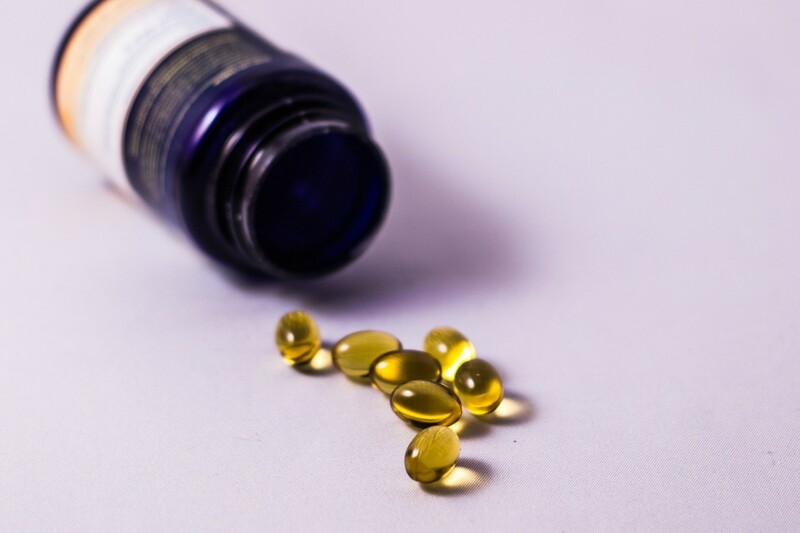 Add fish oil to the diet: Dry skin is usually a sign that something is missing from the diet. Many of the commercial dog foods contain enough of the omega-6 fatty acids, but since they are more expensive, they tend to skimp on the omega-3s and add more of the omega-6 acids. If you think those commercial diets that are labeled “omega-3 added” are going to help, you are wrong. The amount added is insignificant. To help your dog with dry skin, you can feed fresh fish like salmon, mackerel, or sardines (in moderation), or supplement with a liquid fish oil. The omega-3 fatty acids will improve the quality of the dog's skin and help clear up the dry skin. Try coconut oil: As a treatment for dry skin, coconut oil has several advantages. It has high levels of antioxidants and vitamins, so besides being effective for moisturizing dry spots, it can also be used as a supplement in your dog's food. This is a great benefit, because if your dog is anything like mine, she is going to lick off any product you put on her. Use vitamin E: Some of the damage done to your dog's skin when dry is due to free radicals. Vitamin E acts as an antioxidant and will moisturize the coat so that it can improve with the change in diet. In some dogs, the relief is immediate. You can buy the capsules labeled for humans, and squeeze it out and apply it right to the dry skin. When you rub it in, the vitamin will get absorbed pretty quickly, but do not worry if your dog licks some of it off—it is good for his heart and liver. Give other oils: Some veterinarians recommend olive oil first. It has many of the same benefits as coconut oil, so it is both a moisturizer and source of vitamins for what the dog is missing. The dosage recommendations are similar to yogurt, in that you just have to add a teaspoonful to the diet of a small dog and a tablespoon for a large dog. Some vets also recommend flax seed oil, but it should be given at a lower dose—about ½ teaspoon for a small dog. Are the Dry Skin Supplements Going to Make My Dog Sick? If you are in a hurry and give too many supplements to your dog, there can be problems. Excessive fatty acids can cause loose stools, and too much coconut oil or olive oil will make a dog fat. Try switching your dog's diet first. Bathe him in colloidal oatmeal. As long as everything is okay, use coconut oil on his skin and follow directions. If you do not notice any problems with this regimen, you can add fish oil to his diet once a day, use apple cider vinegar the next day, and then vitamin E the following day. If your dog has problems with any of the supplements, you will know which one is causing the problem and can stop administering it immediately. This can be a big help for some inside dogs. Low humidity in a house with central heating or air conditioning aggravates dry skin, which is why this problem is relatively uncommon in outdoor dogs. It is not the best nor the only solution, however, and if your dog is still eating commercially produced dry dog food that has been sitting on a shelf, he will be lacking the nutrients he needs for healthy skin. The best way to tell if you need a humidifier is to look at your own skin. If it is dry, especially if you have noticed it itching, then a humidifier is a good option. If your dog has dry skin, what is the most important thing you can do for him today? Put olive oil on his food. Give him a bath with oatmeal shampoo. Raw homemade diet: Dr. Ian Billinghurst, Give Your Dog A Bone, Warrigal Publishing, 1993. Omega 3 fatty acids <https://www.ncbi.nlm.nih.gov/pubmed/22087720>. Apple cider vinegar: Authenticating apple cider vinegar's home remedy claims: antibacterial, antifungal, antiviral properties and cytotoxicity aspect. Gopal J, Anthonydhason V, Muthu M, Gansukh E, Jung S, Chul S, Iyyakkannu S. Natural Product Research. 2017 Dec 11:1-5. Are eggs a good source for dogs with dry skin? Eggs are one of the foods that we always recommend for a shiny coat. It really depends on why the dog has dry skin; sometimes they help, sometimes they do not. 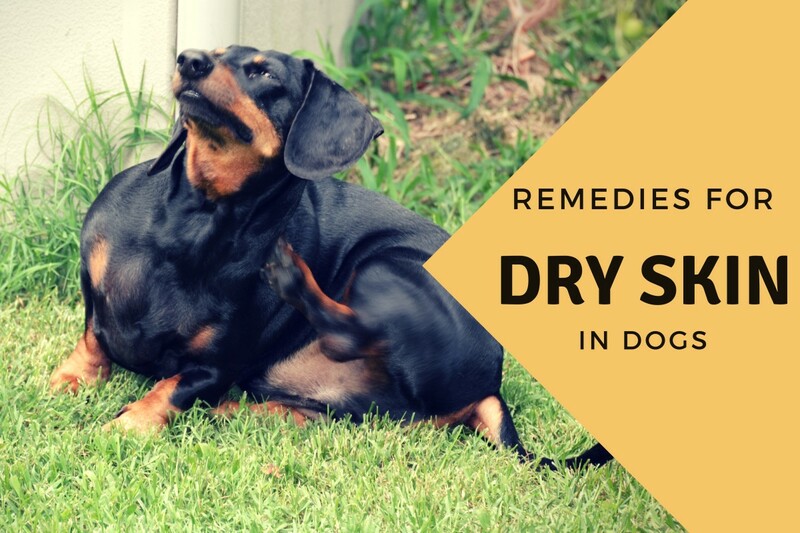 If your dog has dry skin, I would try several of the recommendations here to see if it improves. If you are just trying to keep your dogs coat healthier, then the vitamins and extra protein in eggs is sometimes the best answer. Almost everyone I talk to that has a dog either say their dog has skin allergies, diabetes, stomach issues etc. 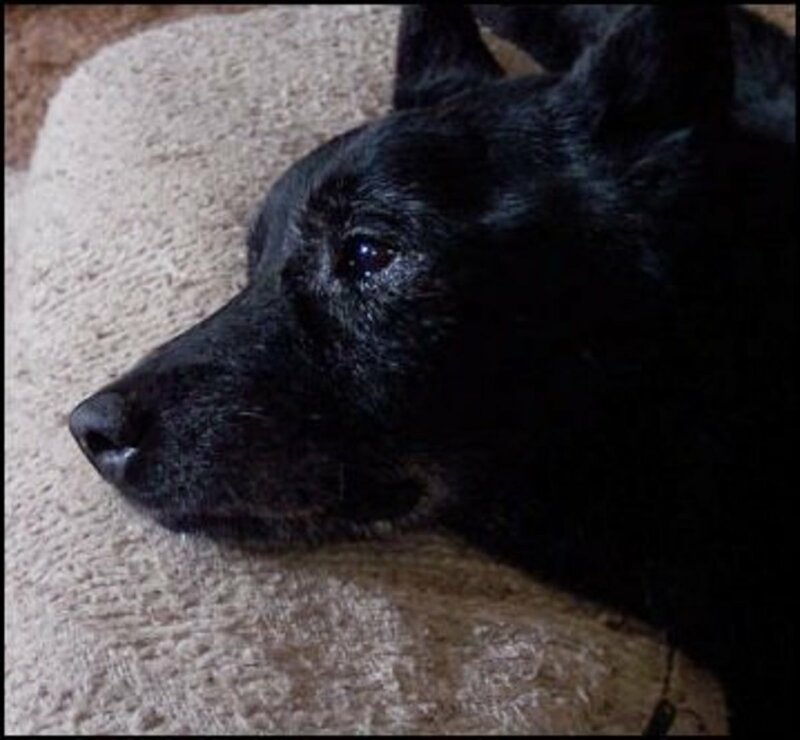 Cushings disease is also very common in the United States. I think dogs are over vaccinated in the U.S. My family comes from Europe and anyone you speak to say their dogs are healthy and hardly have any issues and live long lives. They feed them homemade meals, give them large bones to chew on from the food they cooked for themselves. No kibble foods or any type of dog food due to the fact that the majority of people cannot afford to buy dog food so they are fed fresh cooked meats, rice, potatoes, vegetables. The only vaccine they receive are Rabies vaccinations. So why are dogs living so much longer in Europe, if they are doing everything the Vetinarians are against in the United States? I think you hit the nail on the head when you said American dogs seem to have more health problem, but then asked if it was because Americans are more likely to bring their dogs to the veterinarian when something's wrong. I think that's exactly it. Dogs here, over all, are living longer than ever before and are enjoying better health and healthier lifestyles. Advances in canine nutrition are a factor, but the big factor is that veterinarians have tools, techniques, procedures and medicines that weren't available to them even a generation ago. And the phenomenon known here as the humanization of pets (we don't even put it in quotation marks anymore) sees owners spending big bucks on healthcare for their pets. When I was a kid, the dog never saw a vet unless he got hit by a car. Otherwise it was once a year at the fire station for the rabies clinic, and only because the law required it. 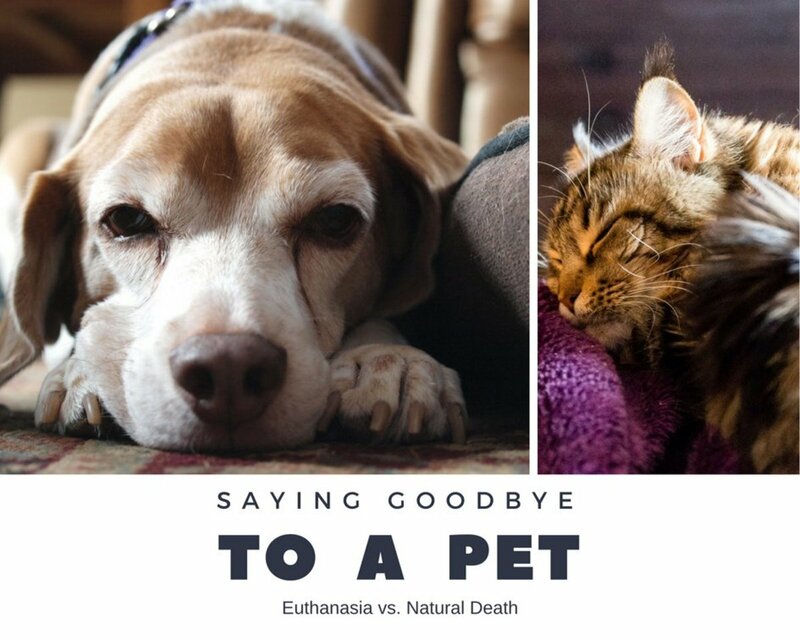 Fast forward to today and people are bringing their pets in for wellness visits, sometimes twice a year (especially senior pets). So, things are getting diagnosed and treated that would never have even been picked up a generation or two ago. We finally hit 73 degrees F here today. After the cold, raw weather we've been having, it feels like summer. We've got doors and windows open for the first time since early last fall. Hi Bob, I agree that the US dogs are not dropping like flies, but if you look at the statistics the dogs in the US have the most health problems. Is it because the owners are more likely to take their dogs in to the vet when there is something wrong, or because the dogs have more health problems because of the diet? I strongly believe that eating processed food every day for your entire life is not healthy. I know that those dogs that eat pizza crust and other junk like that are more likely to have problems, but I think dogs that miss out on eating some natural probiotics (eg a big warm pile of horse manure), natural vitamin and mineral supplements (a little dirt now and then), and most of all natural food are more likely to have health problems. Vets like Dr. Ian Billinghurst in Australia, who practiced both before and after the introduction of processed dog food, agree. Thanks for the comment about the environment down here. When everyone talks about all the unidentified species in the Amazon they fail to mention that most of them are beetles. I get a hundred coming into my house every night, whether I want them or not. I would trade them for a white tail! Another great article, Doc, but you still paint all commercial pet foods with that broad brush of yours. Talking with pet owners 6 days a week, I can testify to the quality of a dog's skin and coat when fed a high quality diet with balanced ratios of essential fatty acids. In most cases they don't have to supplement to keep the skin and coat optimal, however in more difficult cases, coconut oil and other fatty acid supplements work. Some owners work against the good diets by not being able to deny their dog a piece of pizza crust, wheat-based biscuits, and foods containing certain grains that irritate the dog's skin. In order t make it onto the shelf, commercial pet foods must contain over 40 USDA-required nutrients...even the limited ingredients diets. One ingredient can contain multiple nutrients. I wonder how many home prepared diets contain all of the required nutrients, and in the proper ratios to balance the diet? I can't speak for dogs around the world, but of the 80-odd million dogs in the U.S., over 90% of them are on commercial diets and not dropping like flies. The overwhelming percentage of canine allergies are environmental, not food related. But when they are food allergies, the majority are protein allergies, with beef and chicken leading the way. I think most Americans go for the convenience of packaged foods, assured that their dogs are getting proper nutrition. I subscribe to email services from USDA, NIH, CDC, FDA, etc. and every day get recall notices for human foods. By comparison, pet food recalls are rare. We must be doing something right. While I don't disagree with your approach, I do disagree that it's the only approach. Empirical evidence backs that up. BTW, I really enjoyed seeing the pictures of your biome. The wildlife sounds incredible, especially when comparing it to the wildlife we have around us. We thrill at seeing a deer in our backyard, or a hawk roosting nearby. You get to mingle with the industrial-strength wildlife!